Nope, 1000 words of my rambles await you. I promise you’ll not see the phrase “Juniper led”. But you will see the word “Boggin”. After completing the parkrun we headed to the big car park next to the halls. This was nice and close to stumble back later. There were lots of lovely, welcoming “no sleeping in vehicles” signs though. Which we decided to ignore. We’d not been to an event like this before, so we didn’t really know what to expect. The tickets were only £15 (plus the inevitable booking fee) so it wasn’t a huge gamble anyway. We headed into the halls bang on 12pm and joined the queue to get in. A bit too nicely.. it’s only just lunch time !! The room was set out with the various gin-dividual distillery round the edge and some tables and seats in the middle. There was also a large dance floor for reasons which still escape us. We started, as is customary, at the beginning. Boe Gins were our first port of call. Their flavoured gins are probably not for the gin-snobs but we’re hardly that. The friendly chap behind the stall then tried to trick us.. Which one would you like to try? he asked. One.. which One ??!!?? We’ll try them all please ! Among the 4 varieties on offer, it was the full strength Violet gin that really grabbed us. We’d been a bit disappointed with other takes on the Violet fad, but this one was brilliant. As was the Orange Gin Liqeur that was a limited edition, the last of which they’d brought to the show. Although we were in the afternoon session, the place filled up quickly. I’d imagine the evening slot would be even busier, but this was a much more relaxed way of doing things and there was always at least one stall with a) samples and b) no queue to try. It was interesting to see the variety of “unique” marketing angles the various makers had gone for. Small batch, seaweed botanical, made in a shed, all vying for our attention. The Gin craze has started to get a bit out of hand, I wonder what the next big marketing thing will be? At this point the entertainment fired up. Now I’ve nothing against someone doing the likes of Mack The Knife and other Curtiss / Sinatra / Martin type classics but it was a bit loud. (and yes, I used to write for a heavy metal webzine). Volume has its place, and that’s not when someone is trying to explain the complexities of their botanicals to you in the context of Old Tom vs London Dry. As well as the flavoured Gins there were also a range of traditional Gin types for the aforementioned purists. You have to admire the ladies of Argyll though, they say it like they see it. The highpoint was a “senior” lady trying one of the 47% proof gins on offer.. Taking a sip and putting the glass down and letting her opinion be known with a precise and to the point “That’s boggin!!”. 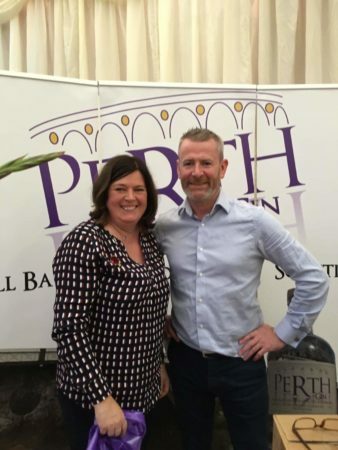 One that emphatically wasn’t “boggin” was the offering from the newly founded Perth Gin company. They’d hit the “smooth” nail on the head (unlike certain others) and we had to have a couple of samples of theirs. Just to make sure it was as nice as it seemed at first. It was. Even those of us who can’t really “do” neat spirits really liked this one. The surprising thing was just how many of the Gins on offer we’d never heard of. 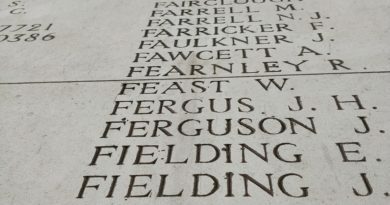 It’d probably be easier to list the ones we had. There were none of the big names present, instead there were small outfits from the likes of Skye, Glasgow, Stirling, Perth and wherever else. Some were made (literally) in a shed while others were designed in house and then distilled by the likes of Eden Mill or Strathspey. We were also surprised (not really) to find that the Tonic makers had also got in on the act. 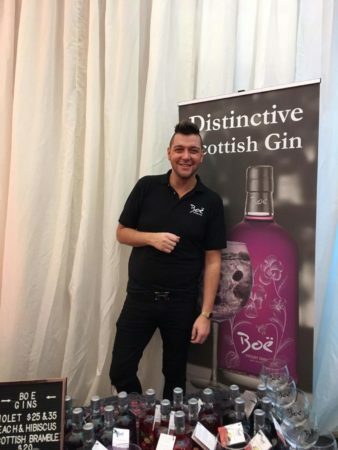 Although Fever Tree and Fentiman’s were the main offerings there were also Tonics from Edinburgh and Port Glasgow bidding for a slice of the lucrative Gin market. After a tentative first spin round the offerings, we went for a second lap. There was something called a gin masterclass happening apparently but we were quite happy where we were. If any of the folk dishing out the samples noticed we’d already been around they didn’t let on. Anyway, we weren’t the only ones and we needed the second lap to decide what we were going to buy. I think drinking god-knows-how-many wee gins is a great aid to making a financial decision !! One that we were definitely going to get was from those nice people at the Bigger Gin Co. This is about as close a distillery as we have to the GinRunners Leadhills retreat so it made sense to support the Local manufacturers. It did help that their gin was (another) one of our favourites. Honestly, whether you’re a knowledgeable Gin aficionado (like half the GinRunners) or just making it up as you go along (like the other half) these festivals are a great way to find out what you really like. And, inevitably, what you don’t. If you really want to try the full range of the UK’s Gins then the raffle is well worth a punt. 10 bottles of assorted gin !!! The next lap was when we finally decided what to take away with us. Of course there was some last minute sampling to do, especially at the Boe stand where basically we wanted them all !! 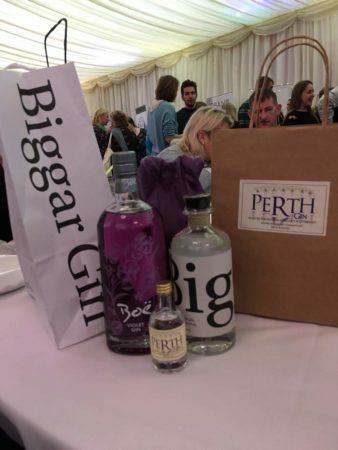 In the end Mabel the Camper’s Gin shelf was treated to a bottle of Boe Violet, a bottle of the Perth Gin and a bottle of the Biggar Gin Co’s offering. That should do us for the rest of the weekend. We also tried the “premium cocktail bar creating some of the best gin cocktails in Scotland”. It wasn’t as horribly overpriced as you may expect. The Strawberry and Wild Berries concoctions we had were, in fairness, lovely. As the session finished we headed back to Mabel for a wee lie down before heading into town for our Tea (or Dinner, depending on where you’re from). The Ginfall gin festival was well worth the ticket money. It’s a brilliant way to try a load of different gins in a very short space of time. In the end we left with just the three bottles, but we could easily have bought more (the Colonsay Gin came close). 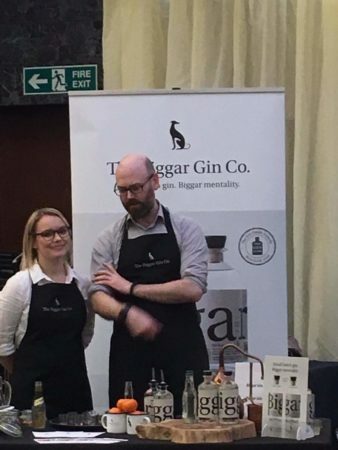 Sociable, educational, informative and fun, there’s an awful lot to recommend about the Ginfall Gin Festivals. Get yourself along to one and, who knows, you’ll maybe find your next favourite tipple. And remember, next time you’re weeding your garden.. think of it as foraging botanicals. 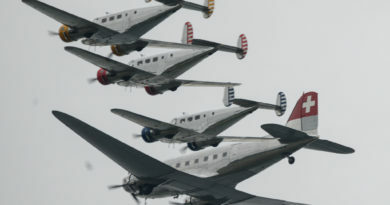 Scottish International Airshow 2018, Ayr.